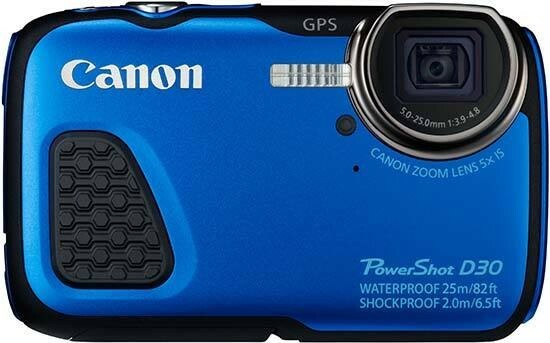 The Canon PowerShot D30 is the newest digital compact camera in Canon's underwater line-up. Now waterproof to an impressive 25m and drop resistant to 2m, the built-in GPS system will let you know exactly where you were so clumsy. Add to that a 12.1 megapixel CMOS sensor, FullHD video and HS system for low light photography, the D30 could be an adventurer's dream. Priced at around £240 / $330, the Canon PowerShot D30 appears to only be available in blue. There are lots of tough style cameras around at the moment – every manufacturer has one or two available at any given time. It's a two-sided coin because on the one side it makes it a bit of a minefield when buying a camera because there are so many. On the other side, though, you have all the manufacturers raising the bar on each new model in order to outwit the others. Now, because of the way that the tough models are built, they have key features that can be improved on, such as waterproofing and toughness. It could be argued that this is the reason that the Canon PowerShot D30 offers even better protection than its predecessor. The underwater protection is now set at 25m which is 82ft in old money. That's an impressive distance and takes you into deeper water than simply snorkelling. Maybe it's down to the design. The Canon PowerShot D30 has had another body change and is squared off where the fancy concave side was before. The edges have been rounded off and thanks to the bowl effect of the face, the lens juts out slightly in the top corner of the camera. We actually prefer this newer design. While the D20 certainly had a more avant garde approach to it's design, we think the more simplistic styling of the D30 will suit underwater explorers a lot more. The sensor is the same 12 megapixel CMOS that we saw on the D20 so we're now expecting a poor dynamic range. Still, they've had a year to fix it, so maybe it will be ok. The HS system is designed to make the sensor more responsive in lower light, so we look forward to testing it in darker situations. The idea behind putting it on an underwater camera will be down to the gloomier conditions of sub-aquatic photography, especially as you can now go deeper into the water. Rubber buttons are a thing of the past these days as the technology has evolved to allow for internal waterproofing which makes underwater cameras look like normal ones. However, to ensure you get an air of toughness – and to resist against salt water - a degree of rubber has been used on the front and back to aid gripping when you're underwater. Rubber lining has also been applied to the battery door and port door to keep them safe and free from water invasion. It also seems that large buttons have been replaced with slightly smaller types and the navigation pad is also a more regular size although it does have a certain springiness to it because of the waterproofing. GPS is great for logging the location of your pictures which you can then match up on Google Maps and sharing them with friends and family. The Canon PowerShot D30 has GPS built-in and can be adjusted in the Set-up menu. It has a similar sub-menu to the Flash settings menu except it toggles the GPS on and off and the GPS logger on and off. Start up time from cold is fast from the Canon PowerShot D30 at 1.5sec. In all fairness, it sits roughly the same as most other digital compact cameras out today, but it's a general improvement in technology. There's only one continuous shooting mode, but it runs along nicely at 2fps (frames per second). It does run a fraction slower than that, but you'd have to shoot over a long distance of time to notice the skip in time. The typical Mode menu has been included on the Canon PowerShot D30 to make it easier to see. The options come up on the right side of the screen and you can choose Auto, Program and two Scene modes; Snow and Underwater. There's also a couple of video options. The Function menu is still on the left side of the camera and allows you to change the resolution, ISO, white-balance and other options. The dark grey with white font and orange highlight menu colouring reflects the Main menu. There are two tabs that separate the main functions available in the Main menu. The Shooting tab is identified by a camera and accesses the options for shooting, such as the multiple focusing modes, i-Contrast, Wind filter and how long you can see the picture when you've taken it. There's also a sub-menu called Flash settings. It only has two options for red-eye, so there's nothing to worry about. The second tab is the Set-up menu. Here you can choose to make changes to the Volume, other sound options, LCD brightness, formatting the card., date & time, languages or GPS settings – which is another sub-menu. Reviewing pictures you've already taken can be done regardless of whether the Canon PowerShot D30 is switched on or off. Pressing the button with the blue arrow will bring up the most recent picture you've taken. You can scroll through by tapping the left/right buttons on the navigation pad. You can also zoom in using the zoom function then navigate around that picture. Pressing down on the pad will alter the amount of information on-screen. You can choose between no information, minimal information and all shoot information including a histogram to aid exposure. The Playback menu has three tabs for Playback, DPOF and the previously seen Set-up menu. In Playback, you can create a slide-show, erase pictures, protect and rotate them, add i-Contrast and sort out red-eye from any flash issues. DPOF allows you to set certain pictures to print in a particular order.